Netherlands winger Memphis Depay is aware that he’s being linked with a move to the English Premier League. The 20-year-old PSV winger has scored twice in the Brazil 2014 World Cup so far, and has been linked to Manchester City, Man United, and Tottenham Hotspur. Real Madrid are also said to be interested in him, according to Sky Sports. 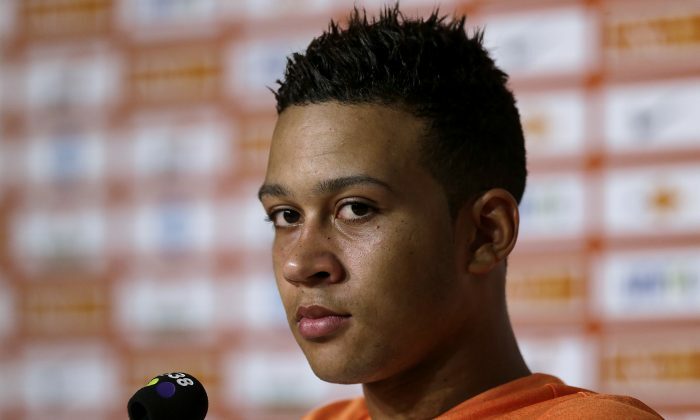 However, Depay will only consider his footballing future after the Netherlands’ World Cup campaign ends. SALVADOR, Brazil (AP) — Costa Rica issued a plea to the referee on Friday to keep an eye on Arjen Robben’s diving. The Netherlands forward earned an injury-time penalty in the second round of the World Cup, giving his team a 2-1 win over Mexico. Costa Rica coach Jorge Luis Pinto is worried about more of the same when his team faces the Dutch in the quarterfinals on Saturday in Salvador. Throughout his career, the 30-year-old Robben has had a reputation for frequently falling and looking for a penalty or free kick. The Bayern Munich forward went down theatrically under a soft challenge late in the match against Mexico, but said the penalty was legitimate. He also said he dived in the first half. “Robben is a great player, but he has this nasty reputation of frequently diving on the pitch,” Pinto said, adding the Netherlands winger should be given a yellow card by referee Irmatov Ravshan if he dives. Costa Rica is one of the biggest surprises of the World Cup. The Central American team finished first in Group D, beating former champions Uruguay and Italy and holding England to a 0-0 draw. Costa Rica then reached the World Cup quarterfinals for the first time by beating Greece on penalties in the second round. “We want to keep writing history,” Costa Rica midfielder Johnny Acosta said. “In 90 or 120 minutes, we will see which is the better team tomorrow.